10 Best Movie Duels You Need to See | Nerd Much? Nothing caps off a film quite like a climactic duel. Two driving characters, whether engaged in a struggle for life, honor, or the mysterious bioterrorism strain in a briefcase, form the backbone of one of Hollywood’s oldest and most revered tropes. These epic struggles can involve blades, guns, bare fists, mechanized suits, or any number of science-fiction inventions, but they all boil down to kinetic action and high stakes for the duelists. At its best, a duel represents everything we love about a story and its progression. It takes the drama, ratchets it up ten notches, and then hammers it into a workable form that makes us bite our nails and pick favorites. After all, an action film without a pulse-pounding final duel feels surprisingly dull. When the smoke has settled, there are a chosen few duel sequences that stand head and shoulders above the rest. Granted, the first item on this list introduces a slippery slope. The scene contains three separate parties — each representing a titular descriptor — who convene at a cemetery for a three-way shootout. It might break the two duelist rule, but it’s well worth it. Although the characters are gathered to collect on a stash of Confederate gold, the monetary stakes are hardly the focus of the scene. Raw, slow-burning tension is the essence of the duel, compounded by close-ups of each character’s unease as they survey their predicament and ready themselves for the moment when the levee breaks. This The Good, the Bad and the Ugly duel scene is one of cinema’s finest. King Arthur’s legendary duel with the Black Knight has become firmly rooted in internet culture, comic store T-shirts, and casual conversation, and there’s good reason for it. An upfront approach to medieval butchery quickly yields to over-the-top gallows humor, providing buckets of fake blood and memorable one-liners for every act of dismemberment. This duel is, in a nutshell, everything that made Monty Python and the Holy Grail so successful. The Star Wars series is packed with thrilling duels, even in the oft-criticized prequels. Flashing lightsabers have always appealed to moviegoers, and the series’ final duel in Return of the Jedi, despite its slower pace, is no exception. 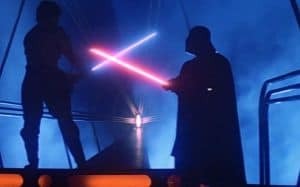 In fact, the emotional heft of a father and son dueling before Emperor Palpatine (with the fate of the galaxy in their hands, no less) is a critical component of what made this duel so powerful. Vader’s final decision to cast the Emperor into the nearby power core provided the perfect conclusion to a well-choreographed and powerful fight. Bruce Lee was a prolific martial artist and actor, and some of his best work can be traced back to Enter the Dragon. The film is surrounded by a nebula of bizarre trivia facts, including its entire audio addition occurring during post-production and numerous on-set injuries (including broken bones and open gashes). Most memorable about the film, however, is the final duel between Lee and Han, which involves a proto-Wolverine claw and lightning-fast kicks. It lived up to Lee’s abilities as a martial artist, which is far easier said than done. This duel may be less lethal than others, but it manages to make itself feel as dangerous and dramatic as the overall film deserved. It’s the classic archetypal struggle between bully and underdog, and thrives on its distinctive 1980s feelings of motivation and teenage spirit. Thanks to The Karate Kid’s enduring duel scene, the song “You’re the Best Around” will forever be imprinted in the minds of athletes and average Joes worldwide. While The Princess Bride is often considered to be a classic among moviegoers, even those who don’t know the entire story can recognize its memorable quotes. Its duel scene, which pits Inigo Montoya against the villainous Rugen, contains perhaps the most famous of them all: “My name is Inigo Montoya. You killed my father. Prepare to die.” Montoya’s vengeance is the principal energy behind this rapid saber duel, and brings the film to a well-deserved and thrilling climax. The fight scenes in the Bourne series have always proved that in the proper hands, anything within reach is a weapon. A perfect example of this system is demonstrated in the duel between Jason Bourne and the assassin Desh, which flows through numerous apartment flats and causes thousands of dollars worth of property damage. The combat is swift, violent, and edited with quick jumps to maintain the scene’s energy, resulting in a polished and brutal final product. To some extent, the Matrix series reintroduced martial arts and slow-motion fighting in Western cinema. The fight sequences were often over-the-top, frantic affairs with a good amount of flourish and overstated impacts, which can likely be traced back to the artificial nature of The Matrix. The duel between Agent Smith and Neo, however, manages to turn the film’s signature fighting into a gritty and awe-inspiring clash beneath the city. Most people have never heard of this film, let alone its dueling scene. Hailing from Poland during the days of Soviet occupation, Deluge is one of the most realistic and pared-down duels in cinema history. It relies on the skill of its actors, as well as the impressive amount of period costuming and environmental details, to make a fluid and unforgettable duel that few modern films can rival. Many of Liam Neeson’s best-known projects feature duel sequences, but few are as impressive or hair-raising than the final confrontation in Rob Roy. Driven by the classic goal of vengeance and modeled after a real Scottish folk hero, Neeson’s titular character engages in a broadsword duel with the villain Roth before a council of noblemen. It’s a drawn-out, bloody, and tense sequence that truly drives home the power of the blade.